Sesame and ginger-infused dressing breathes new life into this black bean salad, taking it in a deliciously different direction. Dive into the flavours of Asia with a salad that can serve as both side dish and healthy lunch. 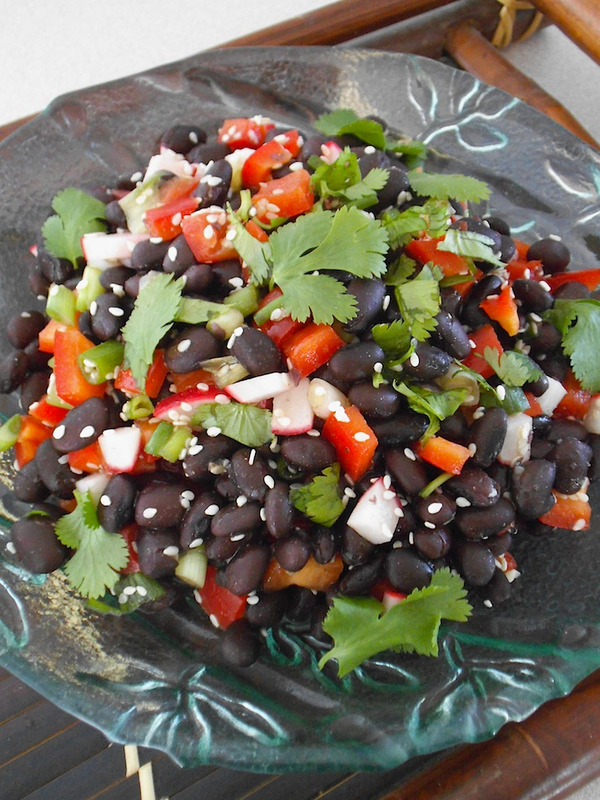 The versatility of bean salads also means that they can be enjoyed in many ways–in pitas, on crostini, as well as plain on a plate. I also tried scooping up the salad with crisp rice crackers, which made the carb lover in me happy. Another reason to love beans is that there’s not the risk of the lovely colours turning brown, as lettuce does. Furthermore, in these temperatures, any leafy vegetables I buy are at risk of freezing and wilting by the time they get from the store to my kitchen. Flavourful salads from the pantry are an easier way for me and my family to eat well during winter’s coldest months. If you are unsure about the radishes, it’s fine to leave them out. Not everyone is a fan of their slightly bitter crunch. I added diced carrots later and preferred the salad with both carrots and radishes. Feel free to customize your salad too. I’m sharing this recipe at Savoring Saturdays and here. Also shared at Allergy Free Wednesdays and Gluten Free Wednesdays. Wow, I think you have a real winner here and we are going to try it. Lunches at home get pretty boring and this would be a great lunch, and left overs would keep well. 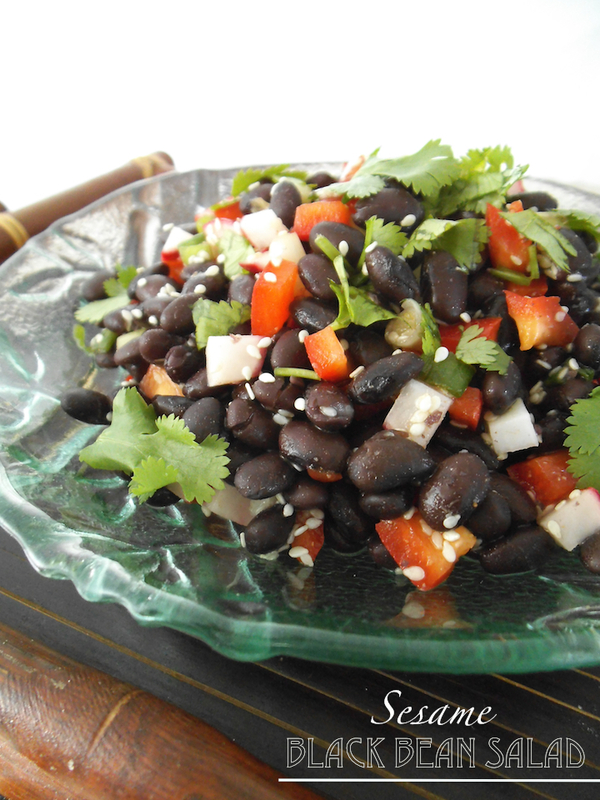 I love how filling and hearty bean salads are. This one looks wonderful! The sesame seeds, cilantro and light ginger/honey dressing sound fantastic together! This is a pretty cool and interesting salad combination I would never have thought of. I admit that while I am not a fan of radishes at all, I think the sesame seeds and carrots are really intriguing. Pinning. Thanks for sharing on Merry Monday! Thanks so much for linking up to Savoring Saturdays again! We adore your recipes and you are my feature for this week. Hope to see you again! I’m delighted to be part of it. Thank you! Sounds like a great meal.Thanks for linking up to Sweet and Savoury Sunday, stop by and link up again. Have a great day!! 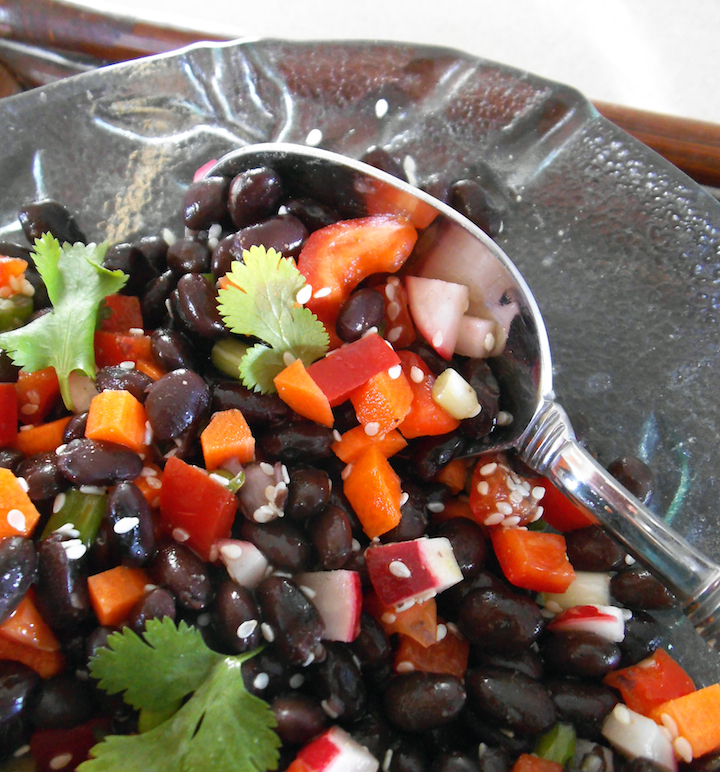 Love this and just cooked up black beans last week – I’m making this!!! Thank you!